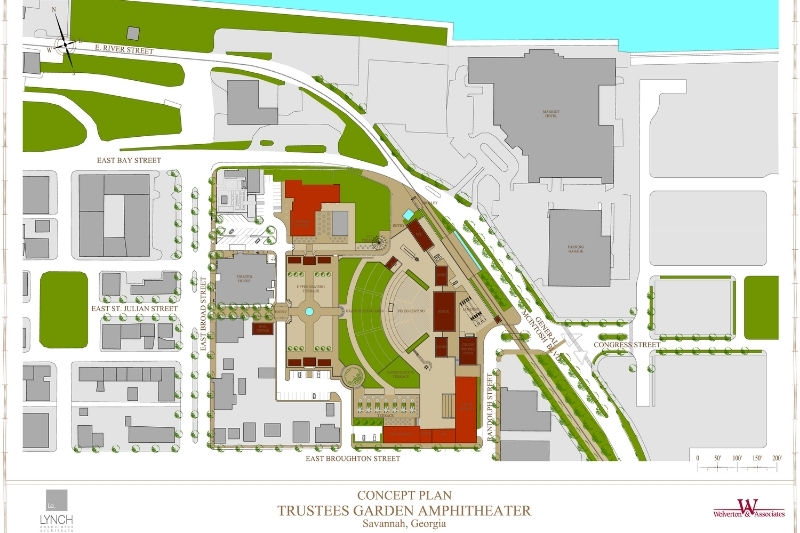 The proposed amphitheater at Trustees Garden builds upon the City of Savannah's urban plan and redefines the east edge of downtown Savannah. As a destination it will serve as a gateway into the city and provide the opportunity for future development in the area. The amphitheater will have fixed seating for 2,000 and lawn seating for 3,000 people with restrooms and concession stands. The property's historic Kehoe Ironworks building along Broughton Street will be renovated into a box office and restaurant. Currently the site is bound by General McIntosh Boulevard, a high traffic thoroughfare. Improvements to bring down the scale of the street and calm traffic through a large green screen wall, trees, medians and sidewalks will be implemented. A pedestrian and trolley extension from River Street will establish a second entry into the Amphitheater.